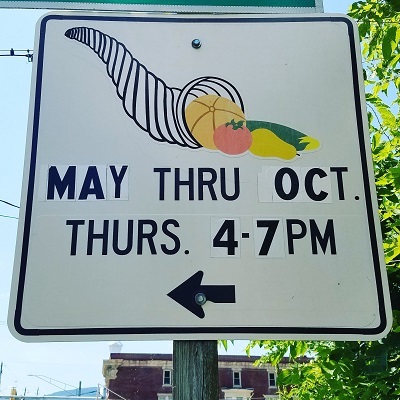 Farmers Market season is quickly approaching and the Middletown Farmers Market will be opening for another season on Thursday, May 2, 2019 from 4 to 7 PM. 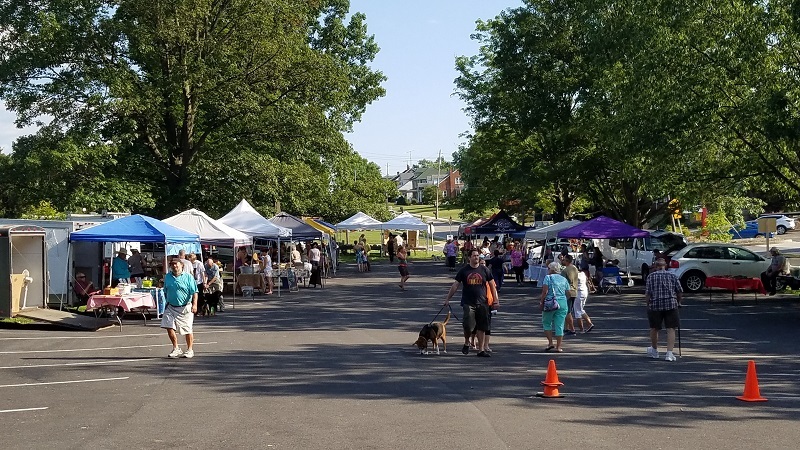 This weekly market is held rain or shine in the Christ Reformed United Church of Christ parking lot at 12 South Church Street, in historic Middletown, Maryland. 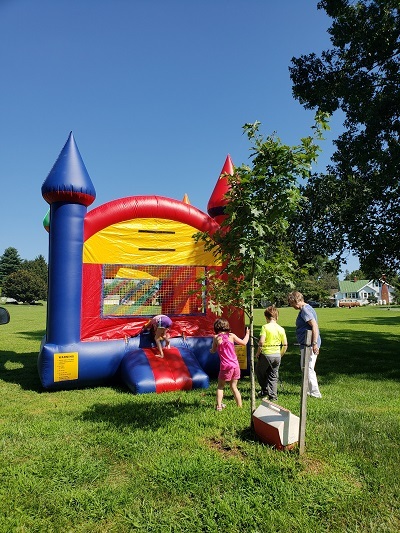 On May 2, Opening Day, the Christ Reformed UCC will provide a Bounce House for children to enjoy while their parents shop. Following the retirement of our long-time hot food vendor, we will have our first new Food Truck of the season—Whistle Punk Farm Food Truck. They will be serving up true farm-to-fork style foods, made from locally sourced meats, veggies, and fruits from farmers in Washington and Frederick counties. Enjoy delicious food that also supports your local sustainable farms! Then on May 9, The Vine Garden Plant Outlet and Spruce Run Farm will be hosting a FREE Mother’s Day Craft. The first 30 children (12 years old and under, please) to visit the market will be invited to decorate a flower pot and plant a flower in it to give their mother. This is always a very popular activity at the market—arrive early if you want to participate, first come, first served. Next up on Thursday, May 16 will be our first Music Happy Hour of the season. While we have many events for children, and while this one is also family friendly, it’s for the adults. 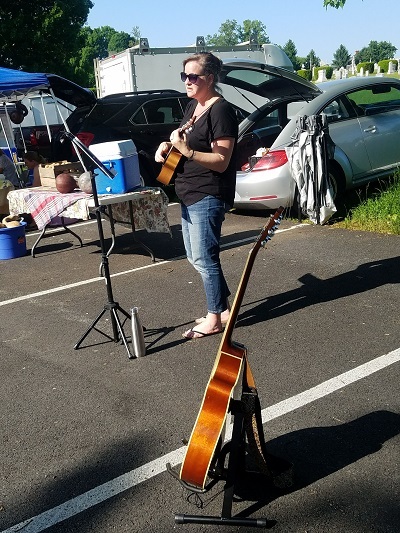 During the 5 o’clock hour, local musician Amy Frevert will be entertaining the market. Many of the vendors are getting in on the Music Happy Hour fun, too. 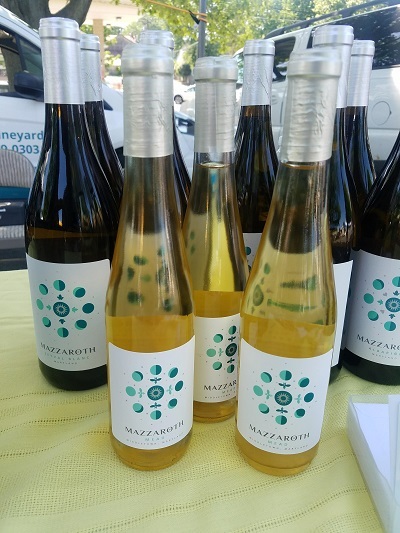 For example, Mazzaroth Vineyard will be entering customers who make a purchase from them in a drawing for a pair of wine glasses—you do not have to be present during the 6 PM drawing to win! Just Baked, LLC will offer their customers $2.00 off a purchase of $8.00 or more. Just look for the Music Happy Hour sign at each participating vendor’s tent for special offers and opportunities. Additional Music Happy Hours will be offered the third Thursday of each month. 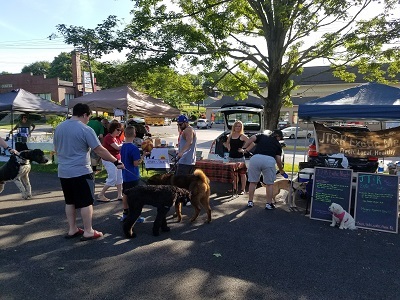 The Middletown Farmers Market is dedicated to improving the overall health and wellness of our community, and so on May 16 also from 5 to 6:00 p.m., we will be hosting our first ever Community Yoga at the Market. Jennifer Carpenter of Jenuine Yogi will lead these donation based Vinyasa Flow classes. Vinyasa is a style of yoga that strings together a variety of poses focusing on breathing and creating a more balanced body. No two classes are alike. Jennifer completed her Yoga Teacher Training in 2018 and currently leads several other community based classes, including nearby South Mountain Creamery. Participants can be of any age, but should bring a mat if possible. Suggested donation is $5.00, but no one will be turned away. Yoga will be held in the grassy area adjacent to the market. Additional dates for Community Yoga are June 27, July 25, August 29, September 26, and October 10. Our 4th Annual Celebrating Canines in the Valley event will be held on May 23. This year’s theme is Farm-to-Food Bowl, and is sponsored by TrendSETTER Treats. Everyone is encouraged to bring their dog with them to the market. Pets visiting the market must be friendly and up-to-date on shots. The market welcomes The Pham, a Vietnamese-American Food Truck for the first time on May 23. The menu includes sandwiches, Vietnamese style tacos and nachos, as well as Spring/Summer Rolls, skewers, and French Fries, and more. The menu can be viewed on the Farmers Market’s website, click on News and Events. Finally, on May 30 we welcome new entertainment to the market. The Lowe Road, a dynamic local Hagerstown band, in it to have fun with an Americana sound. They cover some of your classic favorites, as well as more contemporary indie covers with their own spin. Wow! That’s eight special events in just the first five weeks of the market! Add to that twenty-seven seasonal vendors selling Baked Goods, Bath and Body Products, Cheeses, Crafts, Cut Flowers, Dog Treats, Eggs, Fruits, Honey, Kettle Corn, Live Plants, Local Wines and Spirits, Meats, Microgreens, Vegetables, and offering Tool and Blade Sharpening, plus nine more occasional vendors. The Middletown Farmers Market really does strive to bring the best of everything to the Middletown Valley. With very few exceptions, the vendors create, grow, or make everything they sell. We look forward to you joining us in May, and all season long!